Learn how to make slime with contact solution in minutes with this simple slime recipe! I got a request from my dear son to make galaxy slime. 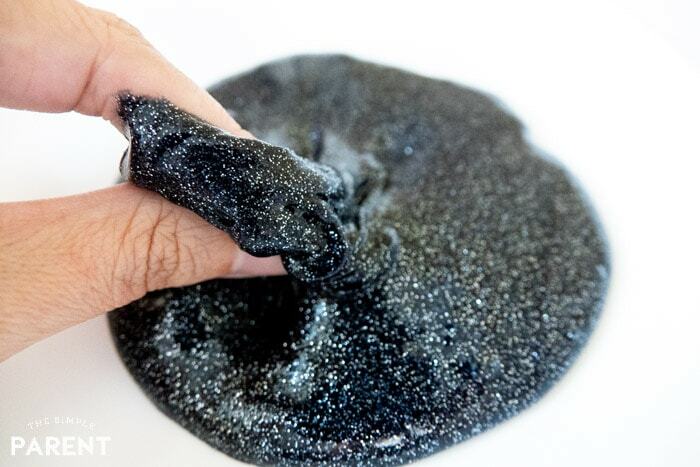 It was a rainy day and we were missing one of the colors he wanted to put in the slime, but we had a bottle of black Elmer’s glitter glue so I came up with a super easy way to make a version of space slime! I promised him we would still make galaxy slime, but he was pretty happy to play with this glitter contact solution slime recipe! I’m obsessed with making black slime. I think it’s the coolest thing! Our Rainbow Explosion Black Slime is one of my absolute favorites. It’s so gorgeous! 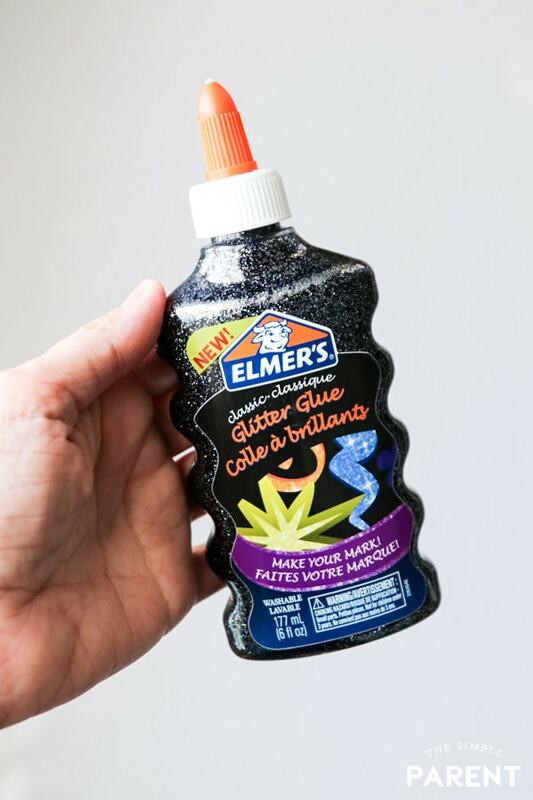 So when we spotted black Elmer’s Glitter Glue, it was in my shopping basket IMMEDIATELY. No questions asked. I knew we were going to make black glitter slime. What I didn’t realize is how cool it is — it’s definitely a space slime if you have kids who love all things related to space. The glitter is like a universe of stars in the glue. It makes for a gorgeous glitter glue slime. This slime recipe is also super easy to make! You can make it with any color of glitter glue too. We’ve also made orange glitter glue slime which is perfect to pair with this glitter slime for a Halloween themed slime! 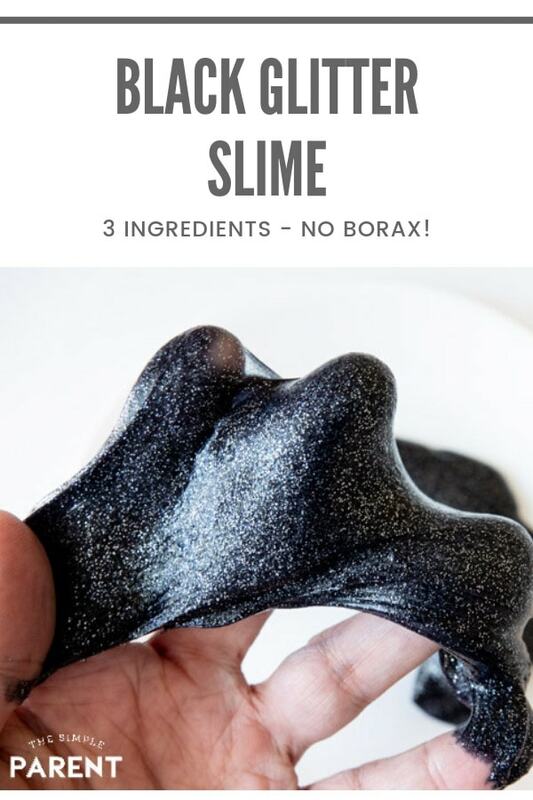 If you’ve tried any of our other slime recipes then you know that I’m a fan of making slime without Borax. We often go the Liquid Starch route because I think it’s the easiest way to make your own slime. But for this recipe, I went with a different approach and decided to make contact solution slime to see how it worked out. 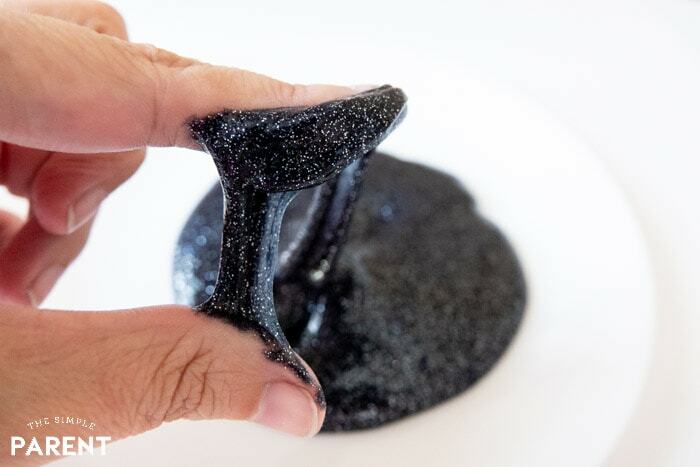 For this slime recipe, all you’ll need is black glitter glue, baking soda, and contact lens solution. I’ve discovered that not every glitter glue is made equal. Elmer’s Glitter Glue always gives us the best result. But the great thing about using contact solution as your slime activator is that it’s easy to find! When we make liquid starch slime, we order a big bottle online. 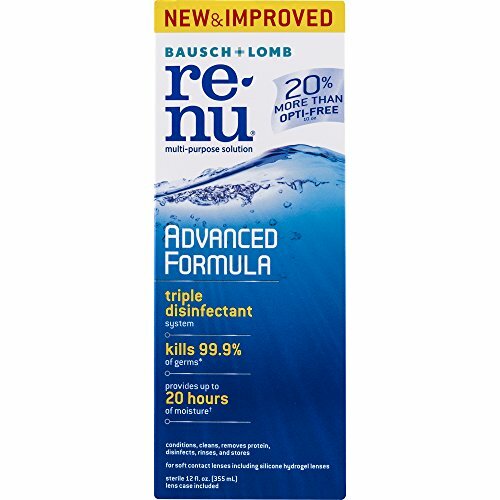 You can order your contact solution online or pick it up at any store near you. It makes it easy to make a last minute batch of glitter slime! Once you decide what color glitter slime you want to make, you’re just a few steps away from having fun! Empty the glitter glue into a bowl. If you want a stretchier glue, you can add some water to the glue. About 1/4 cup mixed into the glue will give you some extra stretch. Add baking soda to the glue and stir. 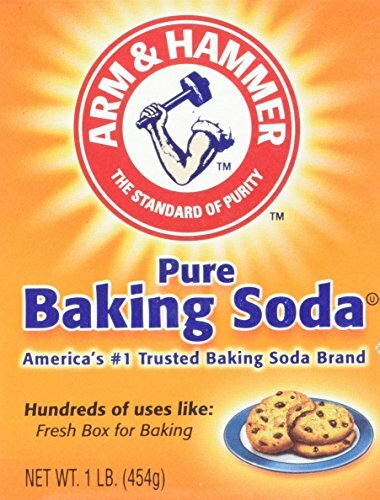 Baking soda is what helps the slime firm up and form well. We sometimes tweak how much we use to get the consistency we like. I like to start with about half a teaspoon and add more if needed. It impacts the ooze and squish factor of your slime. So if you want it to ooze a bit more, try less baking soda. If you want it to be firmer and thicker, try using more. Mix contact solution into the glue mixture. Go slow! The contact solution is what will activate your slime. You don’t want to add too much too quickly. If you do, it will get hard and isn’t fun to play with at all! So start with a bit and mix it in to see what consistency you’re getting. Mix the slime until it starts to get less sticky and firm up a bit. Once the slime starts to pull away from the edge of the bowl, you can pull it out. Knead the slime in your hands. Don’t be afraid to knead it for longer than it feels like it should take! The key to slime is to keep working it. With contact solution slime, if it’s still sticky you can always add a bit more solution. Mastering how to make slime with contact solution is pretty easy to do. Don’t be afraid to play around and adjust the measurements a bit. Every batch of slime seems to be a little different and that’s okay! I’ve found that clear glue slime and glitter glue slime usually take a bit more of your activating agent than slime made with white glue. SAFETY NOTE: Please please please remember that making slime is actually more than just a fun activity. There’s science involved and chemicals are involved. Supervise kids and make sure no one puts slime in their mouth. If you’re looking for a slime that is safe to be eaten, learn how to make edible slime with our recipe. And clean up well! Hands and surfaces! Can you make fluffy slime with contact solution? Absolutely! You just need one extra ingredient – shaving cream. It’s the secret to fluffy slime. You add it into the mix to give it volume. What kind of contact solution do you need to make slime? You can use almost any solution that you want but I shared some of our favorites above. You just need to make sure that the contact solution has boric acid as an ingredient or your slime will not form up when you mix it. If you want to make a clear slime recipe, contact solution slime is the one you’ll want to make. You follow the same directions but use clear slime rather than the black glitter slime. Comment and let us know what color glitter slime your kids would like to make? Or would it be a combination? My nieces want to make purple and pink slime. My kids would like either the black or green slime. My nieces would want to make their favorite colors – pink and blue. They would likely make a combo. My daughter would want to make purple and my son would be orange. Knowing my Grandkids, they would make combination. I know the grand kids would like to make lime green slime. That is their color for this year. My kids would like to make purple slime. My son would like to make the purple slime. We have not made slime with contact solution, it’s on our to try lost though! My daughter is 13, she would want black. My boys are 9, he would want green. And the 4 year old would want blue Im thinking. My one grandson would want bright green and the other would want orange. One niece would want pink and the other would want purple. My kids would want the black or orange for Halloween. My son would love red slime and my daughter would like purple. My daughter likes to make blue and pink slime! My niece would love the neon combinations, like Lime Green or Orange. My guess is pink and purple colors. My girls would make pink slime! I think we would have a lot of fun making this black slime! How cool! They would like green and blue slime! My eight year old granddaughter would like to make pink glittery slime. My nine year old granddaughter would like to make blue glittery slime. My 11 year old grandson would like to make green slime. They have made some batches of slime before and they love doing it. My granddaughter would go for purple and pink varieties of slime. I think we would pick pink glitter slime. My grandson owuld love green and blue glitter slime. I like pink lol. My grandkids would love to make black. They cannot seem to get enough slime! My niece would make her favorite color, pink. y daughter would definitely make the black glitter slime. We would make the black glitter slime. It’s a color we haven’t tried. Oh…I love that black glitter slime for sure but the kids would like the lime green. That is such a fun activity, it even amazes me! My older son would want to make green, my middle child woild want to make blue and my youngest would want to make purple. My daughter would love to make purple slime but I like orange slime. My daughter would love to make the blue. My son would love bright green slime. My girls are all so different, we’d end up making one for each. So we’d have a purple, green, and a blue. Making slime is the perfect rainy day activity for our kids ! My grandson would make Green and my granddaughter would make Pink and Purple mixed! My nephew loves making slime. He’d love the black glitter slime. They would like green slime. My niece would love to make pink and blue slime! Well duh, the natural color of slime, green. I went back to wearing glasses so I wonder if I still have some contact solution sitting around anywhere.